When is a Sami not a Sami? 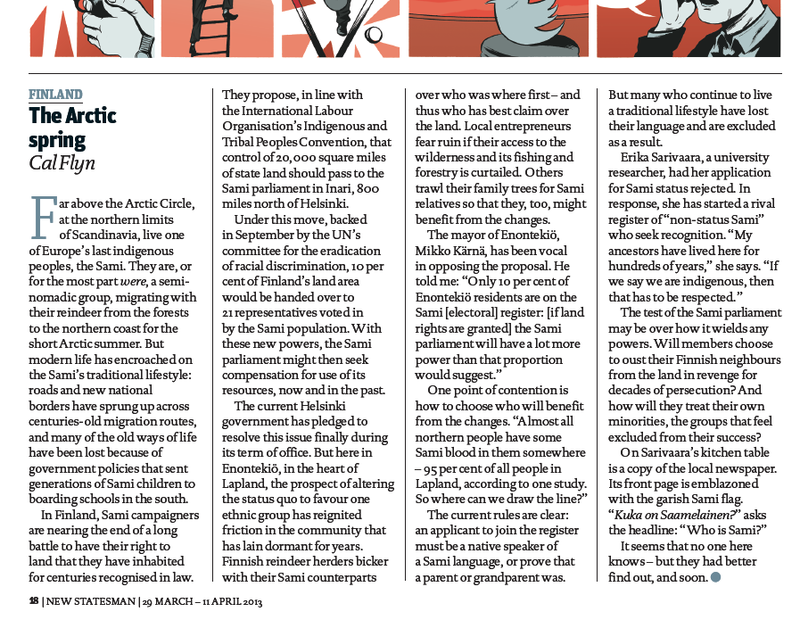 I have an article in this week’s New Statesman magazine, about the Sami people’s struggle for land rights. While living in Enontekiö I regularly came across people from local Sami reindeer herding-families, and wrote about my experience at the autumn reindeer separation here. It soon became clear that the fight for land rights – through the ratification of the International Labour Organisation’s Convention 169 – loomed large in local politics. Local businesses, like my hosts Hetta Huskies and Cape Lapland, were worried that the Sami may decide to limit access to the wilderness if they took control of the land. Already use of reindeer grazing land by non-herders can be the source of some friction. Sami families – rightly – maintained that they had a right to land that they had populated for centuries. But do some Samis have more rights than others? Full text can be found on the New Statesman website here, or after the fold. Far above the Arctic Circle, at the northern limits of Scandinavia, live one of Europe’s last indigenous peoples, the Sami. They are, or for the most part were, a seminomadic group, migrating with their reindeer from the forests to the northern coast for the short Arctic summer. But modern life has encroached on the Sami’s traditional lifestyle: roads and new national borders have sprung up across centuries-old migration routes, and many of the old ways of life have been lost because of government policies that sent generations of Sami children to boarding schools in the south. In Finland, Sami campaigners are nearing the end of a long battle to have their right to land that they have inhabited for centuries recognised in law. They propose, in line with the International Labour Organisation’s Indigenous and Tribal Peoples Convention, that control of 20,000 square miles of state land should pass to the Sami parliament in Inari, 800 miles north of Helsinki. Under this move, backed in September by the UN’s committee for the eradication of racial discrimination, 10 per cent of Finland’s land area would be handed over to 21 representatives voted in by the Sami population. With these new powers, the Sami parliament might then seek compensation for use of its resources, now and in the past. The current Helsinki government has pledged to resolve this issue finally during its term of office. But here in Enontekiö, in the heart of Lapland, the prospect of altering the status quo to favour one ethnic group has reignited friction in the community that has lain dormant for years. Finnish reindeer herders bicker with their Sami counterparts over who was where first – and thus who has best claim over the land. Local entrepreneurs fear ruin if their access to the wilderness and its fishing and forestry is curtailed. Others trawl their family trees for Sami relatives so that they, too, might benefit from the changes. The test of the Sami parliament may be over how it wields any powers. Will members choose to oust their Finnish neighbours from the land in revenge for decades of persecution? And how will they treat their own minorities, the groups that feel excluded from their success? On Sarivaara’s kitchen table is a copy of the local newspaper. Its front page is emblazoned with the garish Sami flag. “Kuka on Saamelainen?” asks the headline: “Who is Sami?” It seems that no one here knows – but they had better find out, and soon.